Doc appears on radio ESPN 1340 AM/92.7 FM Northcoast Tonight with JB Mathers and Tag Wotherspoon to discuss events in sport and a retrospective on Branch Rickey, the front office visionary who was instrumental in Jackie Robinson’s breaking the color barrier in the modern baseball era in 1947. Doc’s father, aunt, and grandmother were all graduates of Ohio Wesleyen University where Rickey both played and coached at the turn of the 20th century. Robinson would have been 100 last month on January 28. Panama’s Rod Carew was one of the greatest hitters in major league baseball history. He was a seven-time American League hitting champion, had 18 straight All-Star appearances, was the American League Most Valuable Player (1977) and had 3053 career hits with the Minnesota Twins and California Angels. He was elected to Baseball’s Hall of Fame in 1991. Born in 1945 in the Canal Zone in Panama on a train in the rear of a segregated car, he was named Rodney by his mother to honor the physician who raced back to help deliver him. His family immigrated to New York City in 1960 where he was an excellent high school student and played semi-pro baseball before entering the minor leagues and then the majors, becoming Rookie of the Year in 1967 for the Minnesota Twins. But Rod Carew’s story after his major league playing career ended is a humanitarian one – a combination of both medical and personal tragedy, resilience and astonishing coincidence. Listen to Danielle and Doc today for an amazing “fact is stranger than fiction” story. The relationship between the United States and Cuba under the current administration is now in limbo after the recent thawing of relations under the Obama administration. Baseball has always been one of the important shared cultural traditions between the the two countries going all the way back to the 19th century. 58 years ago, there was a brief moment in time when a professional baseball team, the Havana Sugar Kings, represented the potential for cultural commonality between the US and Cuba even after Cuba’s revolution in 1959. Ultimately, the Sugar Kings, who won the International League World Series in 1959, became a political pawn between Major League baseball and the Eisenhower administration and Fidel Castro. The demise of the Sugar Kings in Cuba presaged the rapid deterioration of US-Cuban relations that was to continue for more than a half a century. But, hope springs eternal. With some of the best major league players in baseball hailing from Cuba, and a need for Major League Baseball to expand international markets in order to stay competitive with professional basketball and football, one never knows what role baseball holds for potential cooperation between the two countries in the future. Join Danielle and Doc today as they begin 2018 by first looking at two of our neighbors to the south, Mexico and Guatemala. Mexico has a time-honored tradition of basketball, and its popularity continues to grow at the national and local level. Basketball is also played in small communities in Guatemala including indigenous Mayan groups – notable for participation by women and young girls. And finally, a fascinating brief look back at a Mexican-American high-school basketball team team in Texas that won an improbable city championship almost 80 years ago – and its cultural reverberations today. Join Danielle and Doc as the look at themes from 2017 that included Mexico’s unique interconnection to US economics, border culture and history through the lens of sport, the varied connections to Latin America and the Caribbean via the sport of baseball in particular, and finally the national and hero worship of two distinct transcendent athletes: Argentina’s Diego Maradona and Puerto Rico’s Roberto Clemente. Argentina’s Diego Maradona is considered, along with Brazil’s Pele, to be the greatest soccer player of the 20th century. Short, stocky, part devil, part angel but all too human, Maradona was blessed with extraordinary vision, unparalleled dribbling skills and an operatic sense of the dramatic. Maradona is an athlete that transcended sport. His career was a rags-to-riches rise-and-fall and a symbol of nationalism in Argentina and even in Italy where his professional team in Naples became synonymous with regional southern Italian pride. And, in the space of one World Cup game, Argentina’s quarter-final against England, in 1986 , he scored two of the most iconic goals in the history of soccer – they both were “epic,” for different reasons – we’ll discuss why in today’s show. You don’t have to be a soccer fan or even sports fan to appreciate the Odyssey and grand narrative of Maradona. Sam Blair’s ESPN’s 30 for 30 documentary, Maradona ’86 is one of many about Maradona. Eduardo Galeano’s Soccer in Sun and Shadow is a beautifully written book about the world of soccer in its many dimensions and perspectives. Join Danielle and Doc – Next year will be the 50th anniversary of one of the most iconic images in the history of sport and politics – the photograph of United States sprinters Tommie Smith and John Carlos and their black-gloved raised fists on the medal stand during the 1968 Summer Olympic Games in Mexico City in support of the Olympic Project for Human Rights and in protest of the injustices and poverty in the American black community . Mexico was the first Latin American and Spanish-speaking country to host the Olympics, and the government was eager to use the Mexico City games as a way projecting the image of a modern and progressive country. But a week before the games, student protests about economic and political injustice in Mexico took a violent turn in what is now known and commemorated as the Tlatlelolco massacre where a still undetermined number of students (some estimates are from 300-400) were killed by government troops and more than a thousand arrested. Today we’ll look back at those turbulent times that are strangely similar to recent political events in both Mexico and the United States. 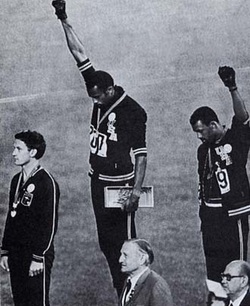 200 meter dash victory stand: gold-medalist, USA, Tommie Smith (center), bronze medalist, USA, John Carlos (right), silver-medalist, Australia, Peter Norman (left). Norman also supported Smith and Carlos and the Olympic Project for Human Rights but was ostracized for his political stance upon his return to Australia, much like Smith and Carlos were in the USA. Smith and Carlos carried Norman’s coffin at his funeral in 2006. 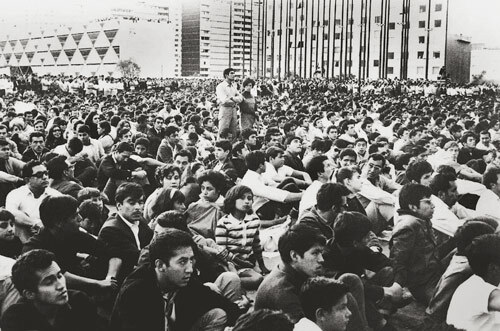 Student protests in Mexico City and the Tlatlelolco massacre prior to the opening of the 1968 Olympic Games.